Director Stephen Frears has spent most of storied career selling tales of cheeky behavior involving miserable folk, occasionally darkened with a devious sexual edge. "Tamara Drewe" offers the filmmaker a shot to hone his gift of social disruption, galloping forward with a merry-go-round tale of betrayal, deception, and lust. Overlong, but humorous and spotlessly performed, "Tamara Drewe" is an appealing web of discontent, given a dry Brit twist and some needed immoral sway. 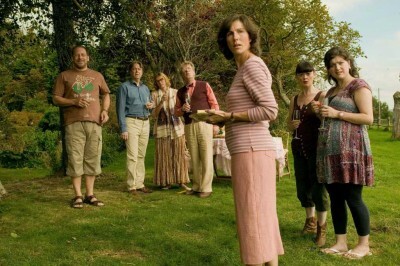 In rural England, a retreat for writers has been established by successful author Nicholas (Roger Allam) and his supportive wife Beth (Tamsin Greig), enticing a range of frustrated novelists, including Glen (Bill Camp), an invasive American. 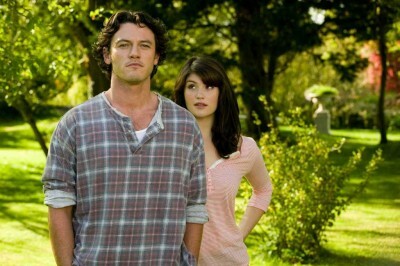 The serene farm filled with animals and wilted literary ambition is soon disrupted by the return of journalist Tamara Drewe (Gemma Arterton), a neighbor girl who's come back, boasting a spectacular nose job, to sort through the affairs of her family estate. Stunning the community with her newfound beauty, Tamara inadvertently sets off a chain reaction of domestic disturbance, taking a lover in dimwit rock drummer Ben (Dominic Cooper), breaking the heart of old crush Andy (Luke Evans), tempting adulterer Nicholas, and vexing jealous troublemaking teens Jody (Jessica Barden) and Casey (Charlotte Christie). Adapted from the British comic strip (complied into a successful graphic novel), "Tamara Drewe" is a rather complex machine of characterization and comedy, dusted with some serious love for Thomas Hardy. The challenge commands Frears to handle the material delicately, refusing to pull any superfluous moment from of the script (written by Moira Buffini), out of fear the whole thing will crash down around him. The fullness of the writing is unexpected, as the early going promises only a modest romp around a minefield of writer neuroses and forbidden sexual desires. Taking titular glory, "Tamara Drewe" isn't really about Tamara Drewe. A newly confident spoiler in a land of easily convinced men, the lead character is the catalyst for rotten decisions, triggering a wave of temptation as the community works out their urges and dreams, some more maliciously than others. Buffini keeps the antics remarkably well balanced, clearing room to understand every face in the crowd, maintaining a farcical verve that keeps the damage on the move for the first two acts. Through Beth's suspicions, Andy's depression, Glen's distraction, Ben's stupidity, Nicholas's arrogance, and Jody's destructive trespassing, Frears illustrates a lively series of interactions and duplicity, brought to life through an exceptional ensemble that finds the ache and the laughs in their performances. Greig and Camp are especially harmonious as the wounded pair finding each other over the course of a wretched year, wading through troubling revelations and uncertainties that require finely shaded reactions. Arterton is equally as compelling. After spending the last year playing blockbuster princesses and indie film victims, her work here is revelatory, able to bubble confidently as the resistant temptress with a vulnerable core. As the feature moves toward its conclusion, Frears can't peel himself away from this enticing group. "Tamara Drewe" is light enough, with a few cartoon visual cues to ventilate the film some, but it doesn't find a peaceful, concise conclusion, easily rolling 20 minutes past its expiration date, heading into a gloomy climax that misses its satiric mark, perhaps out of fatigue. Some patience is required to receive the whole fattened narrative, but "Tamara Drewe" sustains its initial spark. With this masterful cast and skillful direction, a prolapsed conclusion knocks the film off its feet, but doesn't leave a scar. Buy tickets to "Tamara Drewe" now!